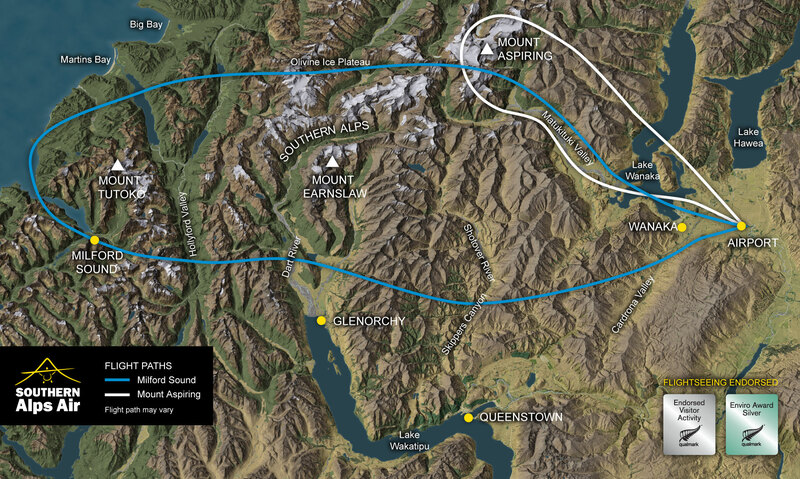 Southern Alps Air operates from Makarora and Wanaka Airport. Southern Alps Air is Wanaka’s only locally owned and operated fixed wing scenic flight company. It has been operating in this region since 1975 and has an excellent safety record. We take pride in offering unobstructed views from window seats and personalized service. As a Qualmark endorsed company, we take pride in working to the highest industry standards. We are Civil Aviation Authority Certified and members of the New Zealand Tourism Industry Association, Lake Wanaka Tourism and Tourism Flight Operators New Zealand. We understand that all businesses create environmental and social impact through their activities. Ours is no exception. We try to actively reduce any adverse effects through buying wisely, using resources efficiently, disposing of waste responsibly, reducing noise pollution and providing an environmentally and socially responsible service to our clients. As Southern Alps Air is committed to being a sustainable business, we have the following environmental practices. To reduce noise pollution we try to avoid flying over walkers and climbers and we only land in designated areas to preserve the natural landscape. We offer a free service of flying rubbish out of the Siberia Valley. Trampers/walkers are invited to leave their bagged rubbish on the Siberia Valley airstrip it is collected by our pilot and flown to Makarora and disposed of in the correct manner. We encourage visitors to the area to pick up any rubbish they may see on their way. Our aim is to preserve the natural landscape of our World Heritage National Parks. Pilots are trained in engine handling to reduce energy and emissions.